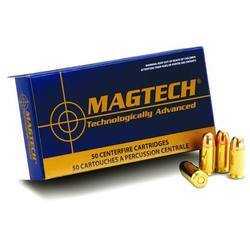 When it comes time to purchase ammunition for your next trip to the range choose Magtech. Magtech shooting sport ammunition is an excellent brand of high quality, low cost target ammunition. Each cartridge is assembled using only the highest quality components and rigorous quality control standards at every stage of the manufacturing process. The result is an affordable, value packed ammunition that delivers the top notch performance you demand... round after round. Velocity at 50 yards: 1027 fps. Velocity at 100 yards: 961 fps. Energy at 50 yards: 270 ft/lbs. Energy at 100 yards: 235 ft/lbs.